Grease baking dish with olive oil cooking spray. In a large bowl, whisk the eggs, coconut oil, and xylitol until the xylitol is dissolved. Add the coconut milk, cream cheese unsweetened applesauce, 2 teaspoons vanilla, cinnamon, and salt. Whisk until well combined. 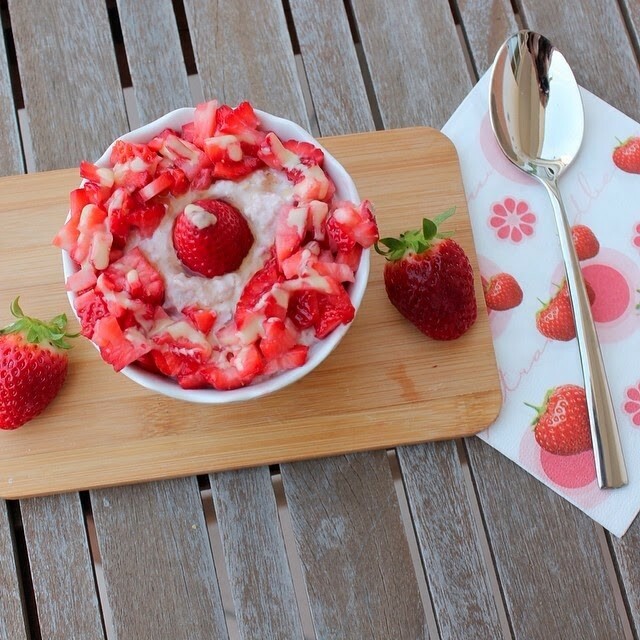 Stir in oats, strawberries, and baking powder. Pour the oat mixture into the prepared baking dish and spread into an even layer. Prepare the Cheesecake Drizzle. In a small bowl add the softened cream cheese, xylitol, coconut milk, and 1 teaspoon vanilla. Stir until well combined. This should be thin enough to slowly pour. If too thick, add more milk, or microwave for a few seconds. Drizzle the cream cheese mixture back and forth (in a zig zag motion) on top of the oats. Turn the baking dish 90 degrees. Drag a butter knife back and forth (in a zig zag motion) through the oats and cream cheese making a swirl design. Bake for 40 minutes. Let it cool for at least 10 minutes before serving.